Cougaar Software, Inc. (CSI), an innovative technology company in the Washington D.C. area specializing in cognitive computing and distributed intelligent agent solutions, is pleased to announce that it has received special thanks from the NATO Supreme Allied Commander Transformation (SACT) General Mercier. Dr. Todd Carrico was a participant and presenter at the NATO Chiefs of Transformation Conference (COTC) in Norfolk, VA on December 14, 2016. 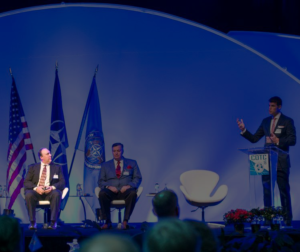 The conference had over 500 attendees including the Chiefs of Transformation from over 20 NATO member countries and many of their partner countries. During the opening Third Plenary Panel, Dr. Carrico was one of four presenters discussing enhanced decision making through advanced computing. Dr. Carrico’s presentation titled “Digital Living Plan – Enabling the Third Offset and Human-Machine Battle Networks” provided an excellent introduction to a complicated but important topic. In summary, his presentation described artificial intelligence based planning using a digital living plan. Unlike current processes, the digital living plan captures mission plan content in a form understandable to both humans and machines, providing the Who, What, Where, When, Why and How tied to battlespace situation.